THIS house has been built by Messrs. Matthews Bros. for Dr. Vaisey, of Winslow. The materials are red brick and local red tiles. Mr. Ernest Newton, of 14, Hart Street, Bloomsbury Square, is the architect. Ernest Newton (1856-1922) was a significant figure in the Arts and Crafts movement, and president of the Royal Institute of British Architects 1914-17. According to his ODNB entry, he combined "liveliness of elevation with a quiet dignity", "using traditional elements and materials but not designing in a way which copied any specific style". He was best known for houses in Kent and elsewhere in the South-East. 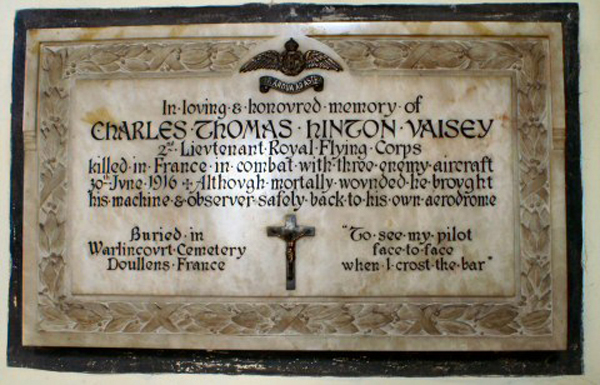 Read more about him on the Chislehurst Society website. Norden House is no.XVIII in his A Book of Country Houses (London: Batsford, 1903), which includes the drawing above and a more detailed plan. Pevsner (Buckinghamshire, p.758) calls it "a simple early work". WORKMEN'S DINNER. 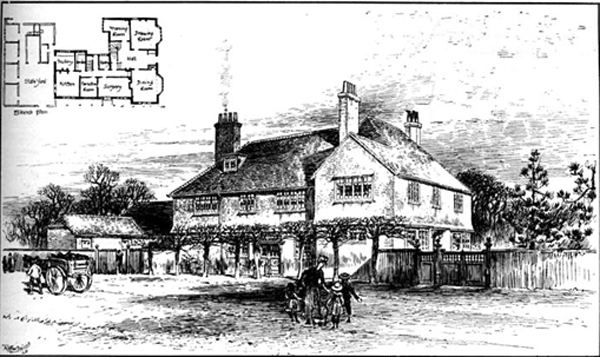 On Tuesday evening last Mr. and Mrs. Vaisey entertained to a substantial dinner Messrs. W. and R. Matthews, and their employés, to the number of 40, who had taken part in erecting their new residence, "Nordens." 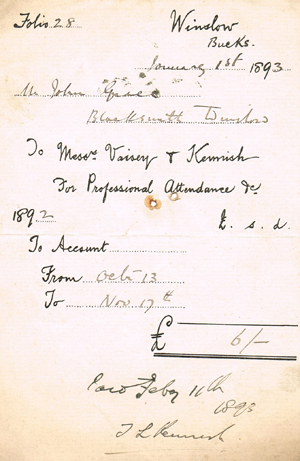 Mr. Vaisey occupied the chair and Mr W. Matthews the vice-chair. At the conclusion of the repast a most enjoyable evening was spent in singing, & c., the principal items in the toast list being "The health of Mr. T.F. Vaisey and Mrs. Vaisey," and "Success to the firm of W. and R. Matthews," both of which were enthusiastically honoured and suitably responded to. 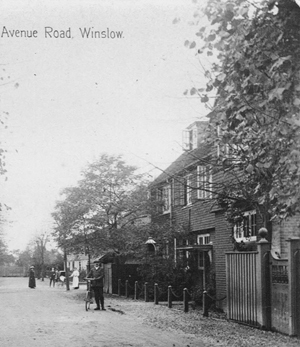 Dr Vaisey came to Winslow in about 1882 from the Buckinghamshire Infirmary (later the Royal Bucks Hospital), where he must have met his wife, who is listed there as a friend of the matron in the 1881 Census. In Kelly's Directory of 1887 he is described as "surgeon & medical officer & public vaccinator 1st district, med. off. workho. & med. off. of health rural sanitary authority & deputy supt. registrar of births, deaths & marriages, Winslow Union, Buckingham road". He took over the surgery furniture and fittings of Dr Newham of Western Cottage, who died in 1890 (Centre for Bucks Studies D/WIG/2/1/23, pp.91, 108), and went into partnership with Dr Kennish (who lived at The Cottage, Horn Street). One of their bills can be seen on the right. Mrs Vaisey's father Joseph Hinton, a retired doctor, died aged 84 at Norden House on 26 July 1906. He was described as "late of Warminster and Batheaston". On FRIDAY, AUGUST 27th, 1920, at One o'clock exact time. Seamless Axminster, Roman and Brussels Carpets; Curtains and Pictures; handsome Sheffield-plated double-branch Candelabra, Cake Basket, and other Electro Plate and Cutlery; Table Glass; Tea Service; Copper Fish Kettle and other Copper Utensils; Kitchen Table and Sundry Domestic Items; Garden Roller, Lawn Mower, "Swift" Gentleman's Bicylce; 9 Head of Poultry, Intensive Poultry House, Coops, Cold Brooder and numerous outside and other Effects. On view morning of Sale. Catalogues of the Auctioneers. Centre for Bucks Studies D/WIG/2/1/72 (May-Oct 1920): Inventory and valuation of Norden House, Dr Vaisey to Dr Leapingwell. 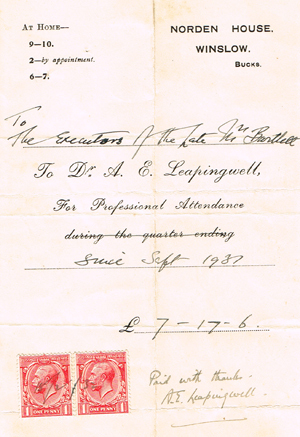 One of Dr Leapingwell's bills, from 1931, is shown on the right. The death occurred on Tuesday, after a short illness, of Mr. Thomas Frederick Vaisey, M.R.C.S, L.R.C.P., of Norden Cottage, Combe Down. 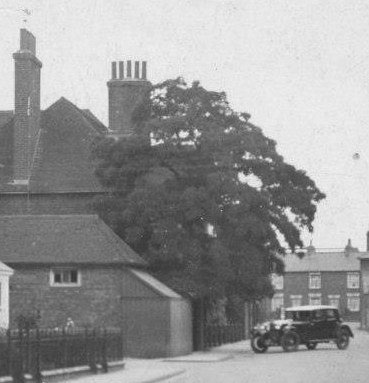 Mr. Vaisey was in medical practice at Winslow, Bucks, for 40 years. He had been living in retirement at Bath for the past eight years. He leaves a widow, two sons and two daughters. The funeral took place on Friday, the first part of the service being at Southstoke Church. Mrs Vaisey died at Bath in 1953, aged 95. Thanks to Ed Grimsdale for some of the information on this page.